About 15 years ago, my parents moved into a neighborhood that had its share of snowbirds and retirees. It didn’t take long for them to start joining in the neighborhood parties and meeting everyone. Dad started talking to an older gentleman, Frank…a WW II veteran and after a while discovered that although a generation apart, they were from the same small rural town in North Carolina. Before I ended up moving to the same neighborhood myself a few years later, I happened to be visiting my parents when one of these neighborhood get togethers was going on. I met Frank & Shirley that night and even though he was 50 years older…I sat and talked to him the whole evening. He then mentioned how he had been looking for a certain recording, Bugle Call Rag & One O’Clock Jump by the Metronome All Star Band. Being a record collector, I had several copies and would later make a recording and give him a copy of the Victor 78. For years, Frank and his wife Shirley would invite me to the annual Big Band concerts that came to town by The Glenn Miller & Tommy Dorsey Orchestras. My wife and I still go with Shirley because, unfortunately, I lost my friend Frank a couple of years ago. He passed away just short of the opening of the WWII Museum in New Orleans where he had been invited to the dedication. 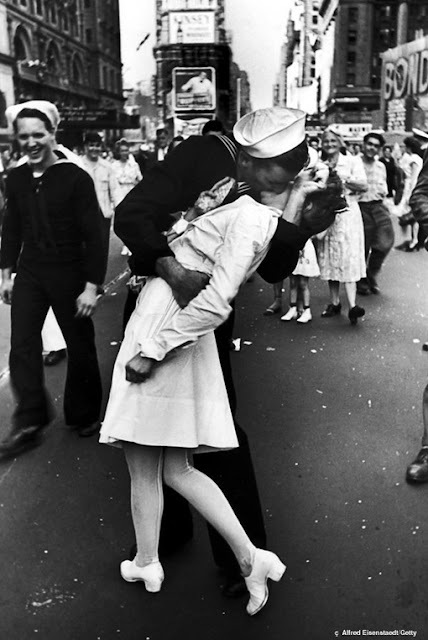 I am often reminded of Frank almost everywhere I look as he just happened to be a bystander in one of the most famous photographs ever taken. This one’s for you Frank!